Our desktop video magnifiers will cater for all of your magnification needs. The ergonomic design makes these magnifiers the clear choice for reading or writing. View confidential documents, letters, books, magazines and newspapers. With excellent functionality they also have adjustable settings to suit the individual user:- Adjustable contrast, brightness and a clear full colour image for viewing photographs, food packaging and doing crosswords or puzzles. A complete user friendly desktop solution. Our desktop magnifiers have 16″ and 22″ screens with full colour and enhanced colour modes. Brightness is adjustable and the XY table allows for easy movement of documents. Small enough to easily move from one place to another. The image quality and lightweight design makes the Mezzo the perfect choice for all your magnification needs, even if space is an issue. NB We only have a limited number of 16″ screens currently available. 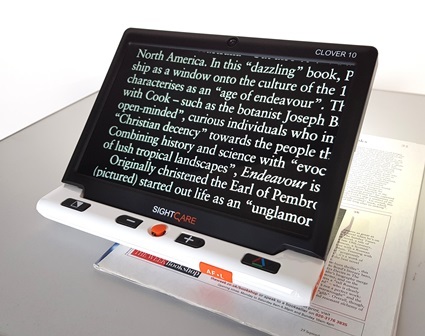 DaVinci is a high definition desktop video magnifier that also features text to speech (OCR). With the push of a button printed text that is displayed on the screen will be read aloud. The camera can rotate for distance viewing and for self viewing. DaVinci’s Sony HD camera displays images in vibrant colour and contrast. See near or far with the Acrobat making it the versatile solution for reading, writing or viewing at any distance. By rotating the camera you can magnify images in the distance and use it to view presentations or look at your self for hair and makeup. A good machine to work on crafts and hobbies because of the position of the camera. The camera is positioned above and in front of the screen. This means that the reading material is also placed in front of the screen. This pushes the screen further away from the user. It may not be the best solution if you have difficulty focusing on the screen. Our Video Magnifier Workstation is available for £5.00 per month. The ability to adjust the height of the table that it can be used whilst sitting or possibly standing.